When I first saw that this event was happening near my home, I could not resist signing up for it. 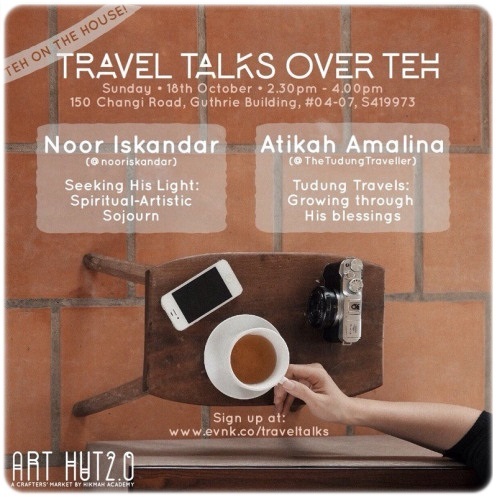 You see, I have been a follower, a fan of both Atikah (The Tudung Traveller) and Iskandar on instagram for a few months. It is not that I admire their wide experience in travelling, I admired their wisdom and their maturity in thinking and reflecting. I follow a lot of travel bloggers online but these two are uniquely different. 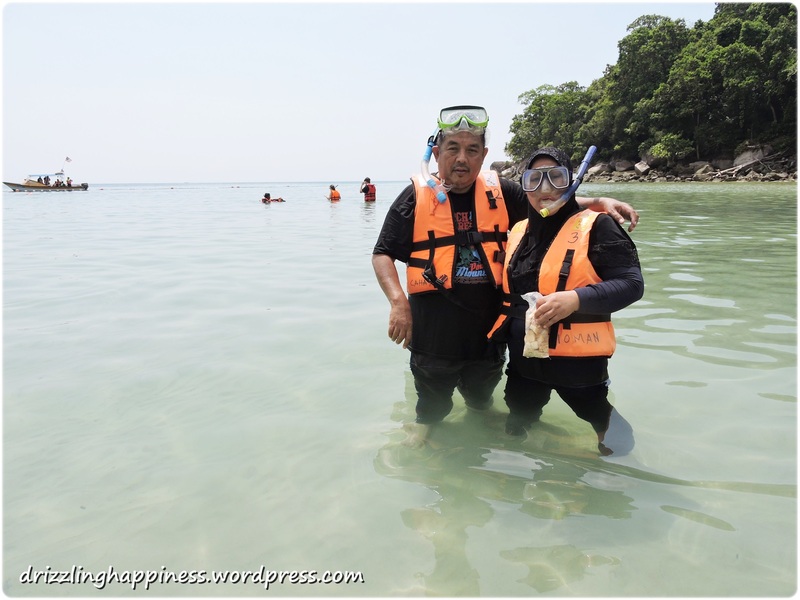 From them, I learned that travel need not necessarily be about ticking off places in our bucket list. I am not saying that one should not have a bucket list of places they hope to visit someday, rather, travel should be a journey you take within you too. I have always been amazed by their talent in stringing the right words together and sending it out as a message, sometimes so impactful, it haunts your subconscious and forces you to think about your own life. When Iskandar started talking and sharing his photos, I sensed that he is generally a shy person, but his depth of knowledge was reflective in his words and photos. It spoke so loudly into my soul too. The experiences, the coincidences, the challenges, were all part of His master plan to turn you into a humble story teller. I shall remember this quote the next time I feel like a broken soul. I shall remember that Allah SWT will only choose His best and strongest soldiers to face the biggest challenges, simply because, He knows, they can handle it. 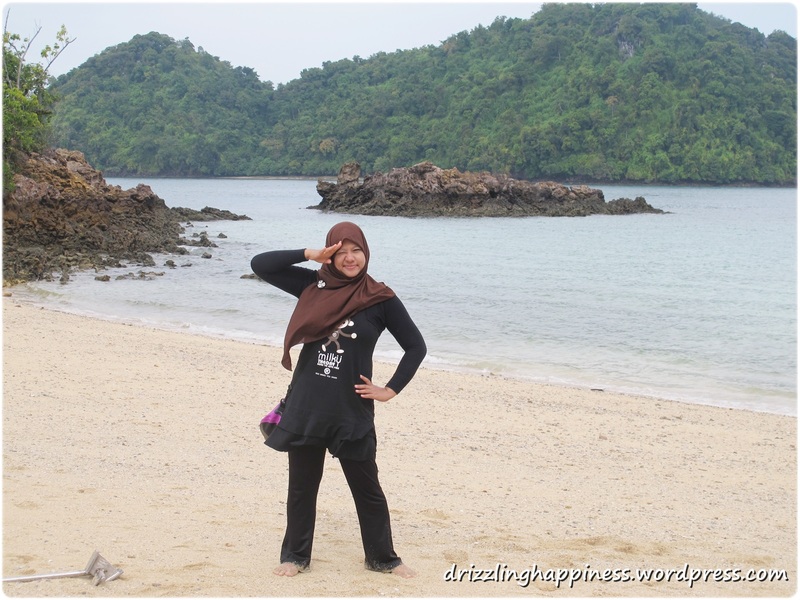 As for Atikah, I found out about her account through my cousin, who is also a travel enthusiast. I had no idea who she was but all her posts on instagram were so inspirational, I could not stay away from it. Sometimes I re-read a few of times so that I could fully grasp her message. 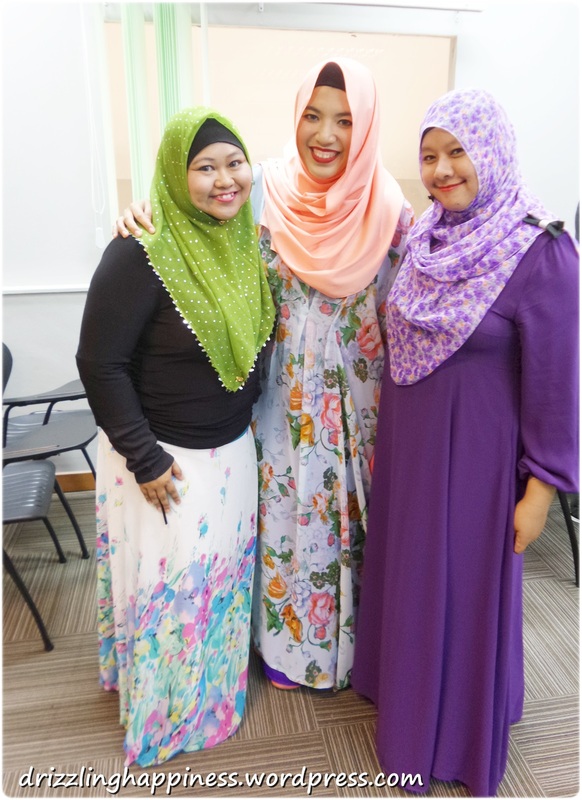 One of the biggest lesson I learned from her sharing was how it was ok to feel overwhelmed. It was ok to feel pain. It was ok not being perfect. As someone who battles with self esteem issues my entire life, these words spoke straight to my heart. No one has ever told me it was ok to lose my way. Everyone is so fixated on getting things right, it is sad that we choose to ignore this human side of us. Growing through His blessings, and His challenges, simply because life is not a bed of roses. This life is not not our destination. This life was designed to be full of challenges. Accept it, don’t run away from it. I totally understand the point she shared about going away so that you can think. Going away to a foreign land will allow you to clear your mind and focus on the present. Whatever calamities you are going through, going away and focusing on yourself will help you heal, and you will come back transformed into a new you. As I sat there and listened, I was amazed at how these two young minds were so full of wisdom and maturity. I mean, when I was their age, I only wanted to earn money and have fun. I did not have such brilliant thoughts. 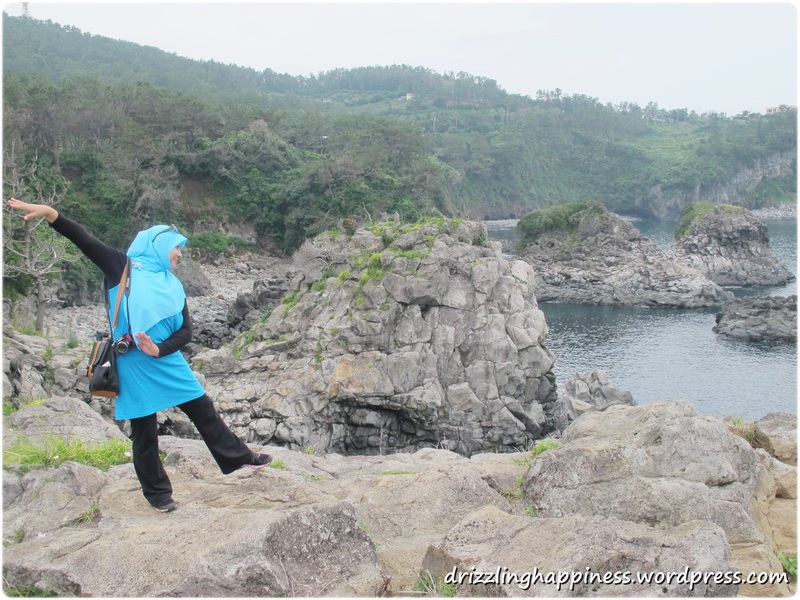 In fact, I only discovered about the wonderful world of travel at the age of 30. Was it late? Perhaps, but I refused to live on any more missed opportunity. Looking back on my own travel journey, I realized that I may not set off to all my travel destinations with a purpose in my mind, but I never fail to come back with a valuable lesson. Most of the time, I have no idea what I was looking for. In the beginning, I was merely tagging along with friends to go overseas but as time passes and I grew older, I learned that regardless of where I go, there is always a lesson waiting for me our there. This session has also allowed me to look at all my past travel experiences differently. Here is a summary of all the lessons I learned, mostly incidentally. Every trip shaped me a little more into the person I was meant to be. In my twenties, I struggled to find my true identity. Yes, most people struggle with their identities during teenage years but for me, it lasted all the way into adulthood. 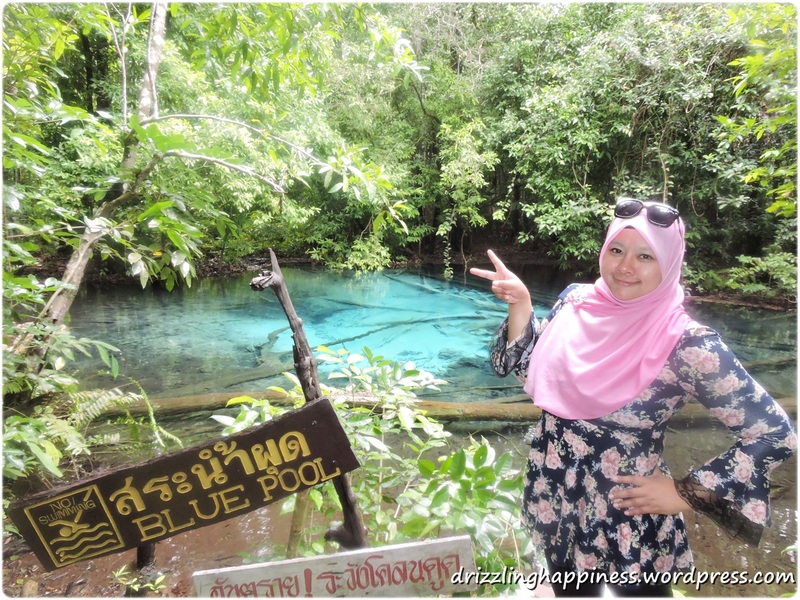 It all started in 2011, where I traveled to a place other than Singapore and Malaysia for the first time and was blown away by the natural beauty of Krabi. I still remember thinking to myself, why keep myself rooted in Singapore when I could travel and see His wonderful creations worldwide? 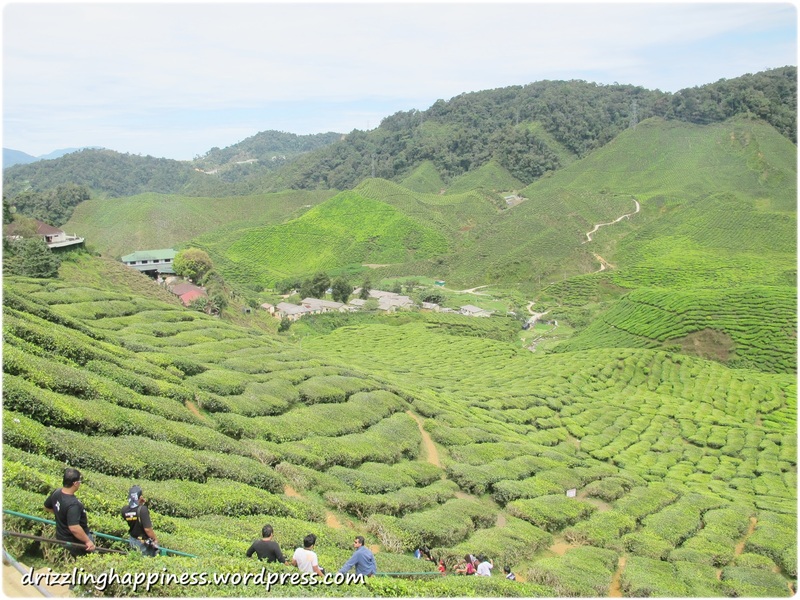 That trip inspired me to initiate a short family trip to Cameron Highlands. It was then that I decided that I want to stay in a place close to nature when I am old er insyaAllah. In the same year, my bestie asked me whether I wanted to tag along with her to Korea and since I had very little experience travelling, I thought, why not! It was my first encounter with snow and I had no idea it would be so magical. From this trip, I learnt the importance of quality thermal wear. Lol. It was also my first time hiking in winter and I had no idea on what to expect. 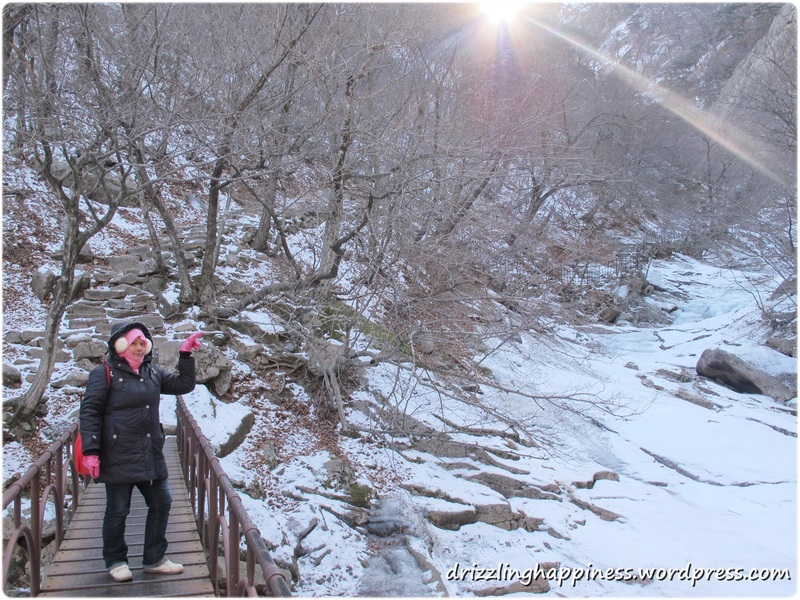 I remembered feeling emotional at Mount Soraksan in Sokcho because I have never seen nature completely and beautifully covered in white. In fact, the bestie made me fell in love with Korea so much, we decided to make a trip back there 6 months later, in June 2013. It was also my first time in Jeju and I never thought I would love nature so much that I was willing to hike with my old and injured knee, just to admire the view. In 2013, the bestie and another friend from Vietnam asked me if I would be interested to travel to Europe. One of their travel mates who was supposed to go along with them was not able to make it at the last minute. I have only started to travel, I did not even dream of travelling to somewhere so far and so different. So I said yes. It was the best decision I have ever made. 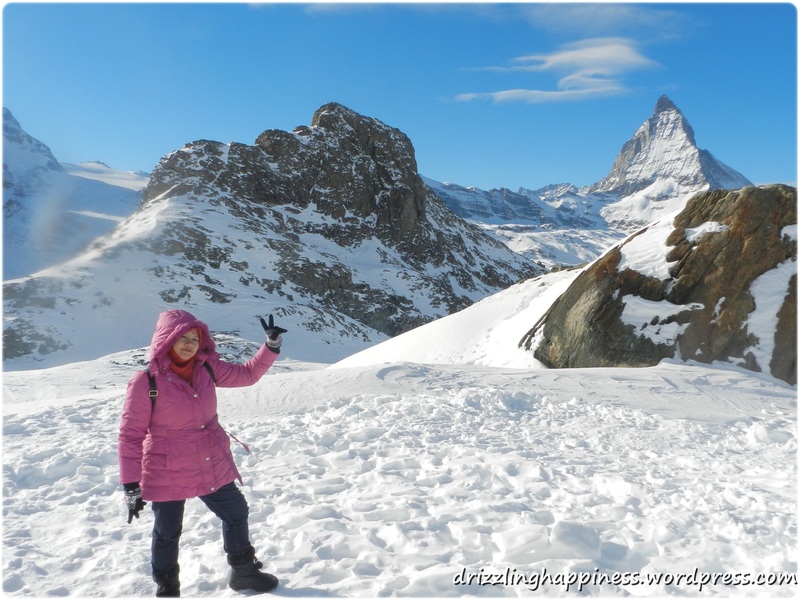 Witnessing Matterhorn in Zermatt, and this time, in a good, quality thermal wear and I did not end up freezing. In fact, I was so mesmerized by MY whole experience in Europe, I felt that I came back as a completely different person. On the first day in Europe, I became a victim pickpocket and I lost my camera. I was looking forward to visiting Rome and learning all about its rich history but this incident numbed me and I was feeling bumped the whole time. Looking back, I should have just chose to live in the present, there was nothing I could do to change this unfortunate incident. This incident taught me to be alert. I am responsible for my own safety in a foreign land. Around this time, I discovered the existence of the wanderlust bug in me. I wanted to continue to travel but my heart reminded me that I needed to go to the one place that I have been dreaming to go since young. In March 2014, I went for umrah with my family. Seeing the Kaabah live right in front of me was an emotional and humbling experience. I was speechless and I felt like I was chosen to be there despite all the challenges we faced while getting our visas. 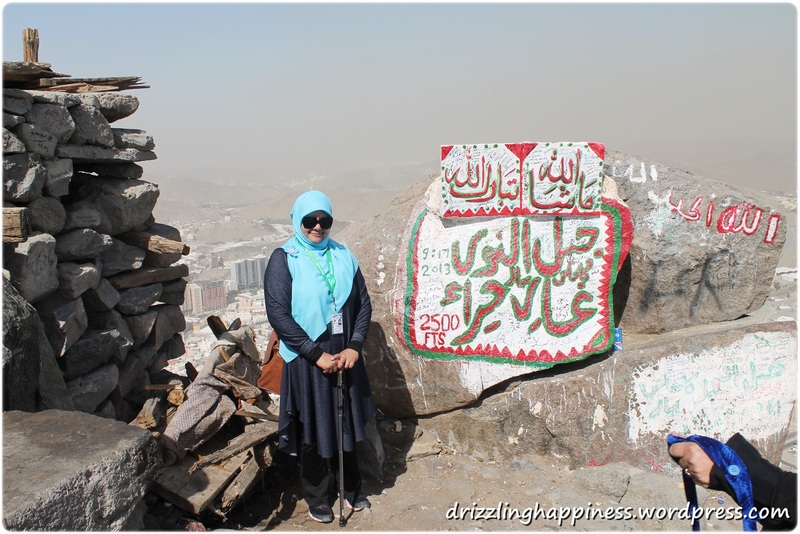 On the same trip, I hiked up Jabal Nur, with a walking stick, with only one strong knee and peaked it. I went into the sacred Gua Hirak, through His grace and it was truly and experience that increased my faith by leaps and bounds. InsyaAllah to perform haji next has always been in my mind. I am so glad that my bestie also loved travelling and she was great with directions (compared to me who constantly gets lost everywhere I go) so we started to plan trips together. I learned that going to places like these, where I can admire His beautiful creations of nature, increased my faith in the Almighty and reminded me how tiny I was in this grand universe. Going to these places was not the most convenient. 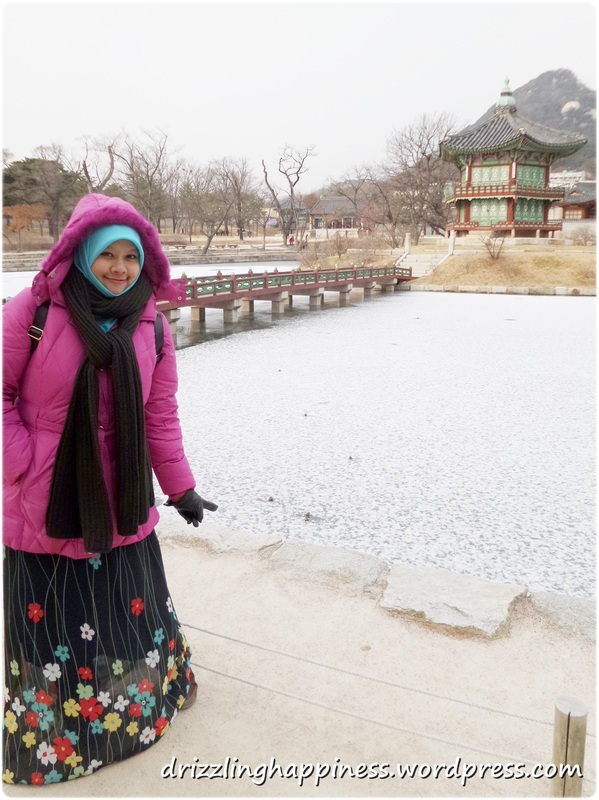 I remembered doing zohor and asar prayers in Gyeongbokgung Palace in Seoul at one of the hidden corners there and it started to snow. None of us expected it to snow, but it did and the whole experience was amazing. I think I have been pretty blessed all these while. Even with this injured knee, and yes I do have difficulty going down slopes and rocky pathways, I did not allow it shake my confidence. The more places I travel to, the more faith I have in my own abilities and in His protection. 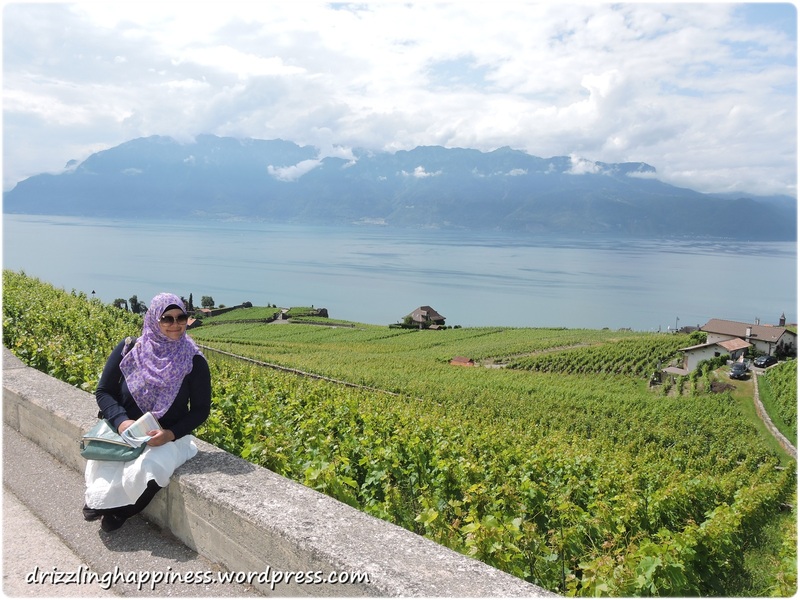 In my last trip in June this year, my parents were not really willing to let me travel to Europe, with the worry that Islamphobia was spreading wildly and it might be dangerous for me, who donned the hijab. However I was determined to go and it took a lot of convincing, that I will be able to take care of myself and I will be protected because I have the Almighty with me all the time. Wearing the hijab, will protect me, not harm me. I went with this belief. I think as parents, regardless of how old I am, they will not stop worrying. That is what they do. 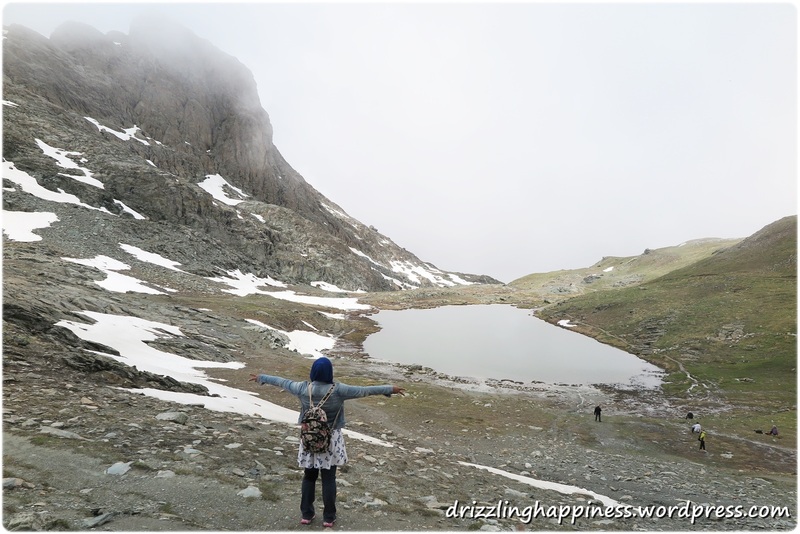 I felt sorry for travelling and discovering all these wonderful stuffs by myself. Sharing stories and photos with my family was not the same as having them with me, experiencing everything with me. Therefore, I wanted to bring them with me to short trips with them when they are opportunities to do so. I think they deserve to have this luxury to travel now, they spent their entire life earning money and bringing me up, it is time to start paying them back. We were not a very well to do family so to travel to us was a luxury. 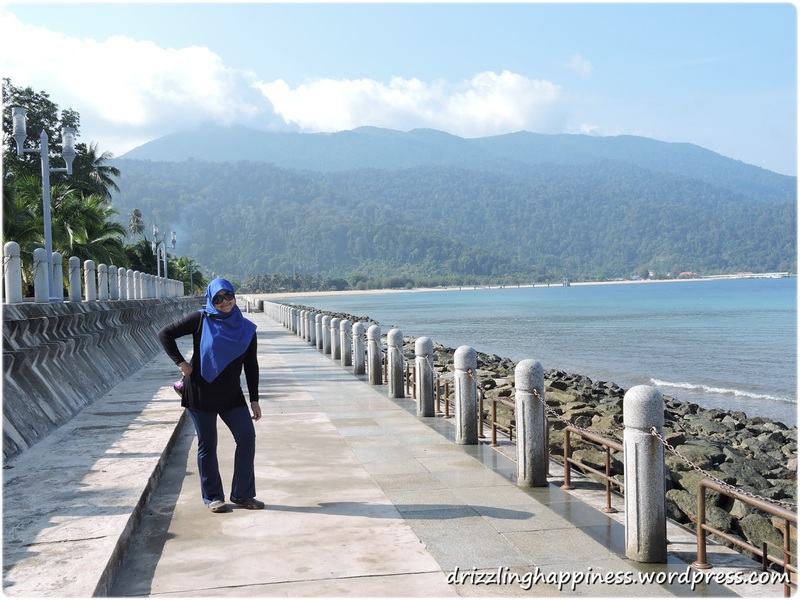 In March this year, we went to Tioman together and in September we decided to go to a last minute trip to Penang. It was their first time snorkeling and they were so excited!! I was pleasantly surprised at how much they enjoyed themselves. Planning the trip with them in mind, I had to consider their health too, they were not able to walk for long distance for long. The trip was about them, not me. These two short trips this year made me realized that I can plan for others too. I was not worried anymore about being lost because I I felt I grew a little more as a person on every trip, be it short or long trip. Every trip was an emotional trip, on different levels, that I did not realized I was on. I learned never to be afraid of the unknown. Shared laughter in foreign places will bind our togetherness as a family. I enjoyed myself seeing them enjoying themselves. This was priceless. Thank you Atikah and Iskandar for awakening me. Thank you to Hikmah Institute for organizing this! Blessed are those who do things for the sake of Allah SWT and may you two continue being the inspirational figures that you are and may you be blessed with more abundance of blessings in the future, insyaAllah. Till, our next reunion, stay healthy. 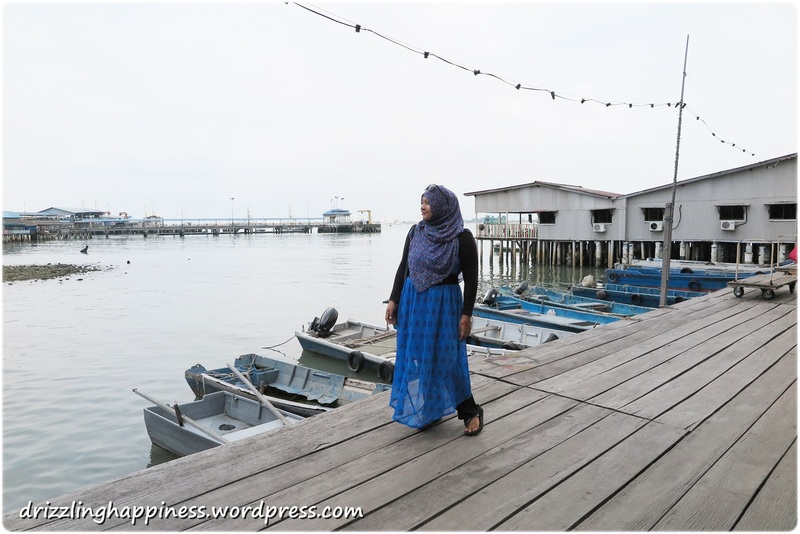 You can view Atikah’s blog here and Iskandar’s blog here. For the full stories of my travel experiences, you can check out the archives.